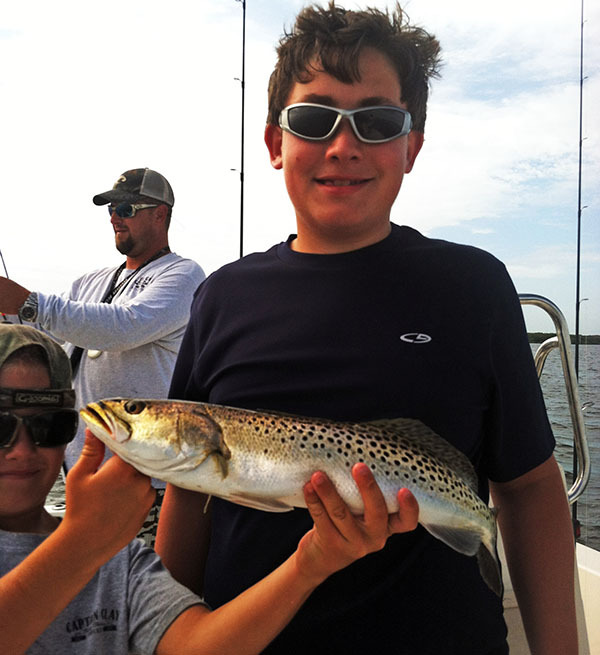 Tarpon aren’t the only thing biting fishing Tampa Bay in the Summertime! 8 year old Gunner with his first ever tarpon. I admit, I’m guilty of being fixated on Tarpon during the Summer here on my Tampa Fishing Charters. Who wouldn’t be? They are huge fish (averaging around 100lbs. ), fight like nothing else and show up in droves! The sheer sight of the silvery beasts, “rolling” on the beach is enough to have clients tell me that I’ve already made their day. Then they hook one and they’re hooked for life on the “Silver King”. But, truth be told, there are tons of different types of fish to fish for during the summer here in the Tampa Bay area. And tarpon may not be your best target with young anglers on the boat, windy conditions, or poor tides. Tarpon fishing can take patience, a good deal of strength, a little experience (for young anglers), and often times really good weather conditions to hook and land one. Not to say that the young guns can’t fight a huge tarpon (they can) and not to say the weather has to be perfect… But, most of the time, there’s plenty of fish that will provide constant action, a more manageable fight for the young guys, and be more cooperative under less than ideal conditions. 9 year old Miles with a nice snook. 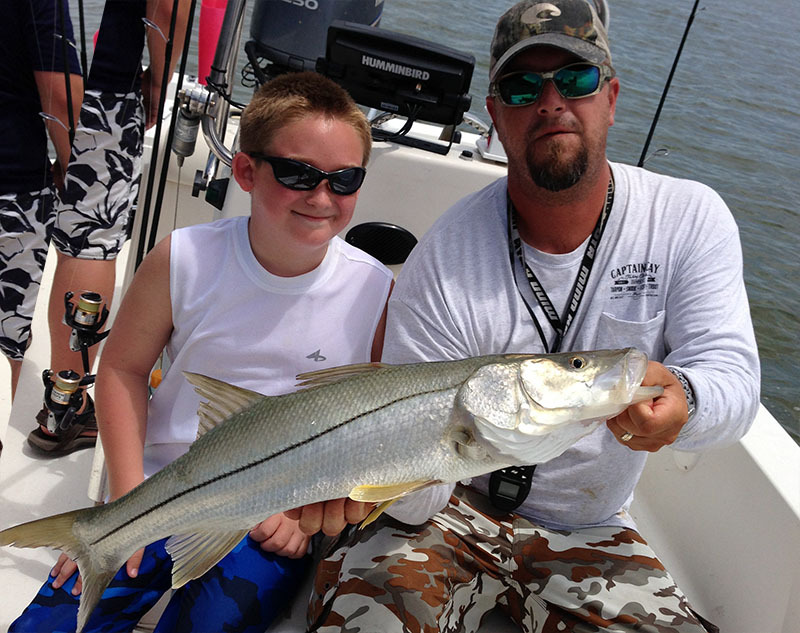 Snook can be one of the most exciting inshore game fish to fish for here in Tampa Bay during the Summer. Given the right tide, the right bait and the right spot. A summertime snook bite can be hard to beat. Spanish Mackerel roam Tampa Bay crashing bait schools every chance they get. Once hooked up, their initial run is drag screaming. They aren’t too shabby on the dinner table either. Sharks ranging from 2 feet long to 10 feet long are ever present during the warmer months here in Tampa Bay. If you’re looking for that big fight with a big toothy fish, shark fishing might be for you. Bull sharks, hammerheads, blacktips, spinner sharks and many other species of shark prowl the shallow waters here and all you need is a big pole and a big bait. 13 year old Armond with a nice trout. Trout are here during the summer. Many people think that trout fishing is poor in the summer time. It’s true that it’s not as easy as in the Spring and Fall but there are some really nice trout to catch during the summer. You just have to look to different places to get into the bigger ones… like the beaches and the passes. Though my favorite summer time fish to chase after is the mighty Tarpon, when conditions aren’t right for them or when you want to chase after something else… There’s plenty of other species of fish to target during the summer fishing season here in Tampa Bay.